Where is the tipping point for a new era of sustainability? This was one of the key questions of the promising UN Global Compact Leaders Summit 2010 last month in New York. 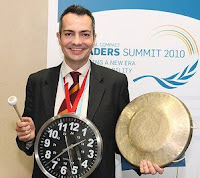 'Official' Summit blogger Dirk Matten has well covered the Summit and its wider CSR context. Therefore, I focus here on my personal reflections and listing the official new resources launched. Firstly, it's great to see the growing momentum of the Global Compact and the whole sustainability movement. The compact itself grew from a 30-40 company club 10 years ago, into the largest CSR network with over 8.000 participants in 2010. The UN Secretary General Ban Ki-moon talked about a new era of sustainability seeing the Compact with 20.000 participants by 2020. Frankly, this looks like linear growth and I'd like to see exponential growth reaching 50.000 or even 100.00 participants. 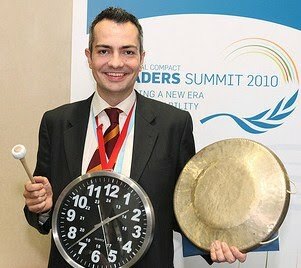 I actually had the funniest (and toughest) job at the Summit helping out my Global Compact friends as the 'Gong Man' and time keeper. The mandate passionately delivered to me by Global Compact director Georg Kell gave me two sleepless nights. How to keep an 1.200 people event on time with dozens of VIPs, CEOs, ministers on stage which are not used to be interrupted? Getting real and being unimpressible by titles and status was my only resort and I even had to gong the moderator once. People told me that this is the 'toughest job' and appreciated very much that the Summit was on time, start to end. Happy 10th Birthday, Global Compact! Wishing you 10 more years with exponential success. Time is ready for the tipping point of a new era of sustainability. UN Global Compact Annual Review – Anniversary Edition. Download. A New Era of Sustainability: UN Global Compact-Accenture CEO Study 2010. Download. United Nations Global Compact Local Network Report 2010. Download. Role of Governments in Promoting Corporate Responsibility and Private Sector Engagement in Development. Download. A Greener Tomorrow – How Caring for Climate Signatories are Leading the Way to a Low Carbon Economy. Download. Moving Upwards: The Involvement of Boards of Directors in the UN Global Compact. Download. Coming of Age: UN-Business Collaboration Since 2000. Download. Innovating for a Brighter Future: The Role of Business in Achieving the MDGs. Download. Global Compact Participants in Latin America and the Caribbean: Contribution to the Millennium Development Goals. Download (English), (Spanish). Women's Empowerment Principles – Equality Means Business. Download. Principles for Social Investment (PSI). Download. Launch of Process to Develop Children’s Principles. More Information. Blueprint for Corporate Sustainability Leadership within the Global Compact. Download. UN Global Compact Management Model. Download. A Global Compact for Development. Download. Guidance on Responsible Business in Conflict-Affected and High-Risk Areas: A Resource for Companies and Investors. Download (English), (Chinese). Supply Chain Sustainability: A Practical Guide for Continuous Improvement. Download. Sustainable Supply Chains: Resources and Practices. Access Website. Lawyers as Leaders: The Essential Role of Legal Counsel in Corporate Sustainability Agenda. Download. An Introduction to Linkages between UN Global Compact Principles and ISO 26000 Core Subjects. Download. The Global Compact Self Assessment Tool. Access Website. Global Compact Network Management Toolkit: Version 1. Download. Human Rights and Business E-Learning Tool. Access Website. Guide on How to Develop a Human Rights Policy. Download. Human Rights and Business Dilemmas Forum. Access Website. The Labour Principles of the United Nations Global Compact: A Guide for Business. Download. Human Trafficking and Business: Good Practices to Prevent and Combat Human Trafficking. Download. Environmental Stewardship Strategy – Overview and Resource for Corporate Leaders. Download. Access Website. Framework for Responsible Business Engagement with Water Policy. Download. Low Carbon Leaders – Transformative Solutions for a Low-Carbon Future. Download. Reporting Guidance on the 10th Principle Against Corruption. Download. Fighting Corruption in the Supply Chain: A Guide for Customers and Suppliers. Download. E-learning Tool: Fighting Against Corruption. Download. Collective Action – Building a Coalition Against Corruption. Download. Doing Business While Advancing Development and Peace. Download. Dialogues on Integrating Human Rights – Testimonials by Business Leaders. Access Website. From Principles to Practice: The Role of SA8000 in Implementing the UN Global Compact. Download. Implementing the United Nations Global Compact in China: Inspirational Case Examples. Download. GRI and UN Global Compact Forge New Alliance. More Information.